SUNANDAR was shocked and terrified when knowing that he got a 3*7cm tumor in his liver. Although he got hepatitis and liver cirrhosis before, he never thought that they would develop into stage III liver cancer. Actually, SUNANDAR’s fear of cancer comes from his wife, because his wife is a breast cancer patient and died after taking operation in Singapore. He worried that he would die after taking operation, just like his wife, also the unpredictable risks of operation. Therefore, when Singaporean doctors suggested him to take operation, he refused immediately, his family showed the same attitude. They decided to find a new cancer treatment which is no need to take operation. SUNANDAR was under great pressure because he found that there was no better cancer treatment in both Singapore and Indonesia. Once by chance, one of his friends learned about his condition and recommended him Modern Cancer Hospital Guangzhou. The advantages of no surgery, 2mm incision, quick recovery of minimally invasive therapy brought new hope for SUNANDAR, he believed that minimally invasive therapy is the treatment that he always looking for. 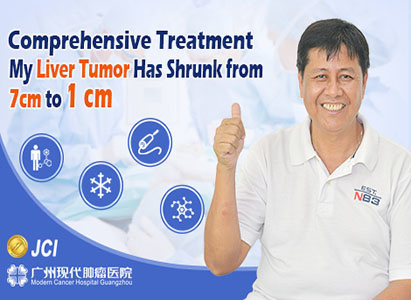 In order to fully understand the minimally invasive therapy and Modern Cancer Hospital Guangzhou, accompanied by his families, SUNANDAR came to the office of Modern Cancer Hospital Guangzhou in Djakarta. Knowing that numerous cancer patients from various countries, like Indonesia, Vietnam, Singapore, etc had gained a new life in Modern Cancer Hospital Guangzhou, and there is no need to take operation, he decided to take cancer treatment in China. With the company of his sister, SUNANDAR came to Modern Cancer Hospital Guangzhou in March, 2015. Examination result showed that his tumor has enlarged to 7.4*3.5cm, at that moment he was suffered from great pain in abdomen and in a low spirit, and he had poor appetite. Based on his condition, the Multidisciplinary Team of Modern Cancer Hospital Guangzhou specially made him a therapeutic plan. So far, he has undergone interventional therapy, cryotherapy, natural therapy. His tumor shrank to 1 cm, the pain in abdomen gone and his condition is under well controlled now. The biggest wish of SUNANDAR is to live a normal life and get back to his previous life. “People foremost, treating with happiness”, the anticancer purpose of Modern Cancer Hospital Guangzhou exactly meets his need. “Modern Cancer Hospital Guangzhou never requests patients to stay in the ward; many activities are hold to create happiness and fun for cancer patients. There are many other Indonesian cancer patients, I communicates with them easily. Although there are many cancer patients from other countries, the help of interpreters help us get a barrier-free communication. I feel happy because we fight against cancer together, and these help I restore to health.” SUNANDA made a comment on Modern Cancer Hospital Guangzhou, and he is leaving the hospital soon. Here, we would like give our best wishes to SUNANDAR, wish him a healthy body and a happy life.